Most Efficient Solar Panels — Which Ones? 44.4% efficient solar cells by Sharp. Notably, these world-leading solar cells by Sharp are in the concentrator triple-junction solar cell category. Such solar cells are complicated and are not used in residential or commercial applications… because they are bloody expensive. They are used in space applications by the likes of NASA, where a bit of extra space (or, as it may be, less space via extra efficiency) can make a huge difference. 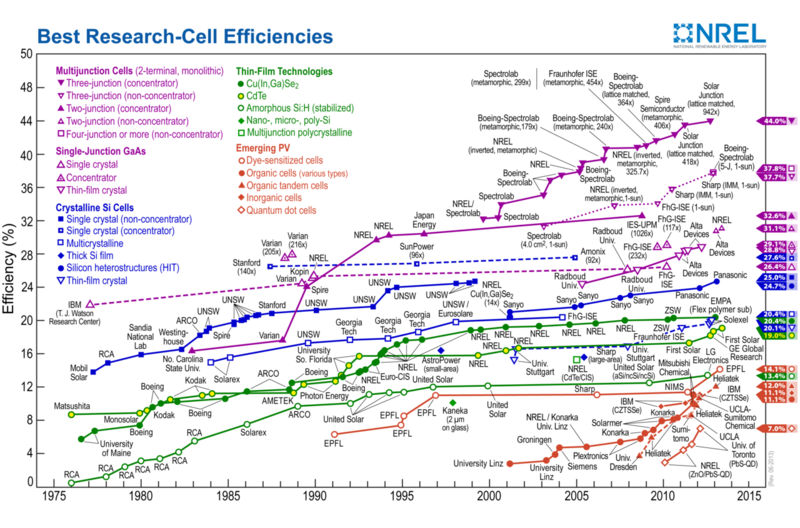 37.9% efficient solar cells by Sharp. Just a step down, these are in the triple-junction, non-concentrator solar cell category. If this is all new to you, it might take you awhile to see the difference in the categories. The difference is that these solar cells don’t use anything to concentrate the light hitting the solar cells, while the 44.4% efficiency cells above do use something to concentrate the light (of course, adding to their costs). 36% efficient Amonix solar modules hold the overall solar PV module efficiency record. However, these are made with concentrator solar cells and are not used in residential applications. Just as one final example in order to show that the variation doesn’t stop there, 15.5% solar modules from MiaSolé hold the flexible PV solar module efficiency record. Naturally, in some applications, one doesn’t just need solar panels, one needs flexible solar panels. But, that probably isn’t you….